The upgraded new Kia Sportage for 2019 features a range of enhancements to cement its position as the brand’s top SUV and its bestselling model in Europe. The new Sportage pairs an updated exterior and interior design with new safety and infotainment technologies, as well as efficient new powertrains complying with future emissions standards. Prices start at €29,495 for the K2 trim level Sportage. CO2 emissions are 130, so it slots in to Band B1. More than 3066 Sportage models were purchased by Irish customers customers in 2017, representing a quarter of the brand’s total Irish sales. One Sportage was sold every 69 seconds globally in 2017, making it Kia’s international bestseller. The five millionth Sportage was built in March 2018, three months into the car’s 25th year on sale, following its introduction in 1993. The Sportage for Europe is produced at Kia’s manufacturing facility in Slovakia. James Brooks , Managing Director of Kia Motors Ireland commented, “the Sportage has been a major contributor the development of the Kia brand here in Ireland. 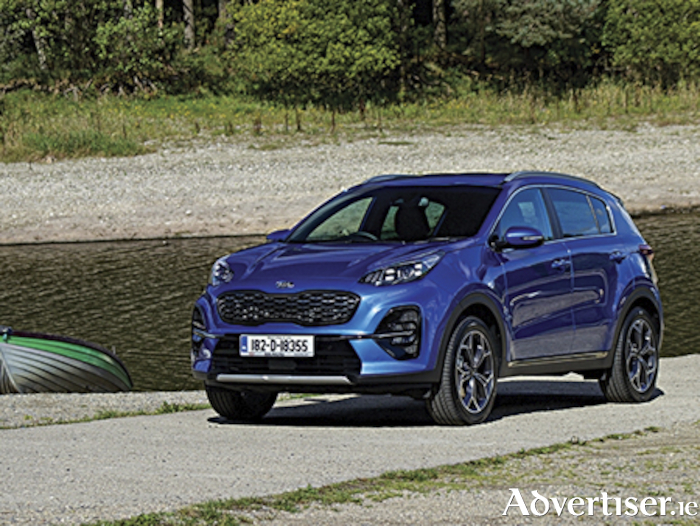 The C SUV segment is one that particularly attracts Irish motorists and the Sportage is a model that is consistently on those consumers consideration list. For 2019 Kia’s three design studios have modernised the look of the Sportage, which features a range of updates to its sporty exterior design. Changes extend to GT Line models, which feature a series of unique upgrades compared to other trim levels.